Forgive me, please. I know that the meditations in my heart and the ministrations of my mind were not acceptable in thy sight, oh my rock and my redeemer. When he first walked onto the subway car, I thought he was handsome. His hat was cute. 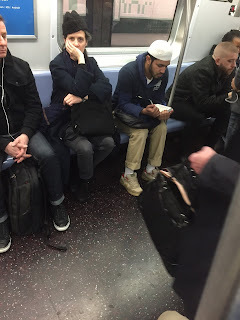 As he sat down, I noticed him reaching into his bag. He pulled out a book in Arabic. 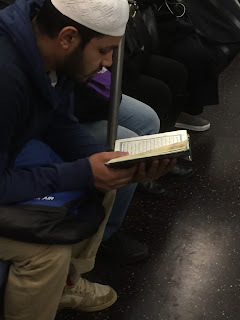 I assumed it was a copy of the Koran. I don't know, still, if it was. My first reaction was one of fear. Is this some extremist who is going to blow up the subway car? Does it even make sense to blow up a subway car at 9:30 at night? It's not rush hour. Does he have a bomb on him or in his back pack? Should I get off the train and wait for the next train? I decided to sit with my discomfort. My friend, the Reverend Diane Ellis, and I have talked about sitting in and letting ourselves experience feelings that aren't good. Accept that we are sad, mad, uncomfortable, embrace it for a bit to understand it better. So I stood in the subway car looking around. I was people watching and waiting for my stop. I was trying to calm my racing mind and my fast beating heart. 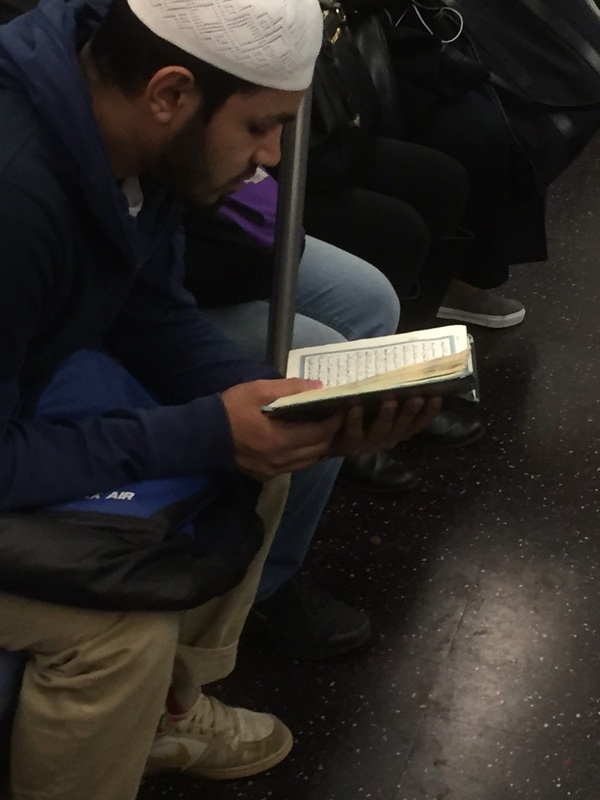 Why should I worry just because a man happened to be reading a book in Arabic on the subway. It could be his favorite copy of the bible for all I know. Isis won a little bit last night. They made me afraid of someone. I'm reminded that the KKK call themselves Christian and for many years made people fear them. I don't think people every thought that every Christian was a part of the KKK though. Why do I immediately assume that every person reading Arabic is even a Muslim? I stood there praying for peace. I pray that the God of us all shows us a way for peace regardless of race or religion. I pray that the God of Islam, Judaism, and Christianity shows and helps me (and us) figure out a way to work together and not fall prey to terrible stereotypes. I know many wonderful people from all religions who all want peace and to treat each other with love and kindness. God bless you random stranger. I refuse to give into fear.